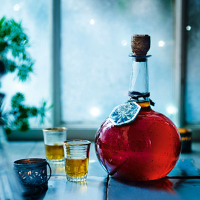 Bitter almond and sweet vanilla add unmistakably festive notes to this Yuletide brandy. Enjoy in a liqueur coffee, hot toddy or warming nightcap. Mix all the ingredients together and pour into a large Kilner jar or wide-necked bottle. Seal and leave to infuse for 2 weeks. Strain and decant into a pretty bottle or smaller presentation bottles, and serve with Christmas cake.